There’s no illustrious history about Strickland Ranch, nor huge financial gains; what there is a love for the woods, cattle and Florida. The first Stricklands came to Florida around 1845; they settled first in Levy County and later in Marion County in the town of Romeo. Henry Clay Strickland had many children; one of his son’s, Andrew Jackson Strickland, was Jim’s grandfather. Andrew married Fleta Cannon and they settled in Red Level (just west of Dunnellon) and raised nine children. Andrew Jackson was killed breaking a horse when Jim’s father, Hiram Lloyd Strickland, was 13 years old. 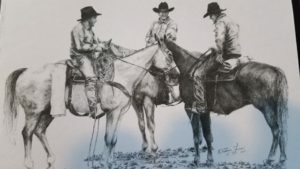 Hiram grew up in open range cattle and hog days and worked cattle for others — along with the ones they had in the woods between Crystal River and Gulf hammock. It was during this time that Hiram established Strickland Ranch. Like so many young men Hiram joined World War II before he was of legal age; he came home after the war and pursued the cattle business and also started Strickland Brothers Sausage Company. He attended University of Florida, earned an insurance license, and became a fireman while still doing what he loved — being in the woods with cattle. During a trip peddling sausage he met Eleanor McDonald; they eloped, had two children and settled in Manatee County. He bought thousands of the small cracker cattle from his stomping grounds in North Florida and brought them south to leased land across three counties while also working as a fireman. He later ran for Manatee County Property Appraiser was elected and stayed in that position till his untimely death in 1973. Jim took over running the cattle on leased land at age 17. Jim grew up working cattle for his father in Manatee County. In 1973 after his father’s death he took over Strickland Ranch — which was nearly all leased land—spanning from Sarasota Bay on the coast to east manatee county. For many years he watched the dramatic change of Florida as he moved his cattle out of many leased pastures and native ranges when they converted to housing developments. He has been fortunate to have many mentors and partners along the way. Jim has been on many agricultural committees and always enjoys being involved with something a little out of the ordinary. In 2007 Parke Wright, Bud Adams and Jim shipped the first beef cattle to Cuba since the revolution. This led to Jim forming Strickland Exports and shipping cattle around the world for several years. He is past President of Florida Cattlemen’s Association and past Chairman of Florida Cattlemen Foundation. 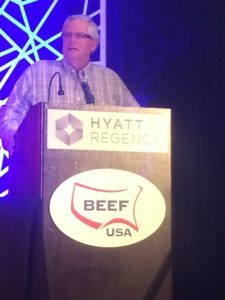 He’s Past Chairman of the second largest agricultural Political Action Committee in the county, the National Cattlemen’s Political Action Committee. 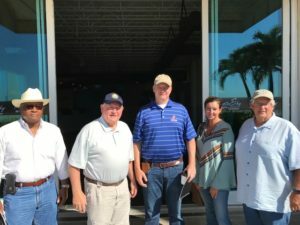 Jim is a partner in Florida Cattle Ranchers Inc and the managing Partner of Blackbeard’s Ranch, Big Red Cattle Company as well as Strickland Ranch. He is also a part owner in Quincey Strickland Cattle. Jim is also working on numerous sustainable local food projects and Strickland Ranch produces beef for Ulele restaurant in Tampa. Blackbeard’s Ranch is now producing beef, Wildflower Honey, Mangalista Pigs and a has a small brewery for visitors to the ranch. Jim is passionate advocate for the conservation of our natural and agricultural lands and serves as Vice Chairman of Florida Conservation Group.